Some flowers grab your attention and work hard to stand out against the rest of the flowers that are in bloom. It can be easy to be attracted to these showers but all too often, the flowers that bloom quickly and sparkle for a short period wilt and die before too long. It is easy to see why many couples would prefer to go for a different option when it comes to finding the perfect flowers for their wedding. The daisy may not be the most exotic or exciting flower you will hope to see but it is a flower that symbolises so much for many couples. It is a flower that never fails to put a smile on people’s faces and it is a flower that can be relied upon. This is why so many couples decide that daisies should be a flower involved with their wedding theme because there is a sense of reliability alongside the style and positive nature of the flower. 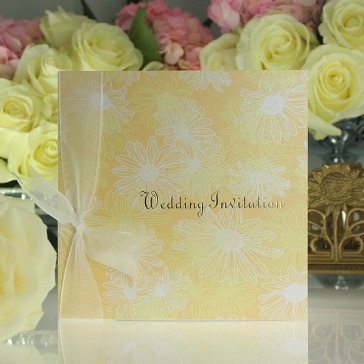 The daisy design of the wedding invitation is slightly abstract, which means it can be used in a number of general themes or styles. With the print extending around the back of the card, this is a wedding invitation that looks great from every angle. The gold foil text on the card looks and feels great and the finishing touch is supplied by the organza ribbon bow. The card can be kept as a keepsake by your guests with all of the information being supplied on a crisp 150gsm white card. For a wedding invitation that says more about your relationship than the style and glamour of the big day, this is an ideal wedding invitation from Olivia Samuel. Tags: Daisy, English Country Garden, Organza.